These study materials will help you prepare for and successfully pass VA's 28 question accreditation exam. Non-accredited individuals (38 USC§ 5901) may not assist in the preparation, presentation and prosecution of an initial claim for benefits beyond one-time (38 CFR§ 14.630 & 38 USC§ 5903). 2. "450 practice questions with answers" (90 pages) - View Sample Questions. The materials above do not apply to service organization accreditation (e.g VFW, DAV, American Legion, etc...) nor practicing attorneys. The very first thing you should have done or should do if you have not done so is fill out and submit VA Form 21a. The application process to become an accredited claims agent is free; however, VA takes its time to respond to your application. The application requires 3 personal references. VA will send a letter to each reference asking for a response as to your character. Unfortunately, VA does not provide a standard form for your references to fill out. It is important that you keep in touch with your references so that you can encourage them to respond to VA's request. Failure for your references to respond will slow up your accreditation. It may take up to 6 months for VA to respond to your application. Some of you may get a preliminary letter asking for more information about your reasons for being accredited. VA will review your background, employment, and accreditation intentions. Once approved, your nearest regional office will schedule a time with you to take the free 28 question exam (25 multiple choice and 3 ethics questions based on 38 CFR§ 14.629-14.637). 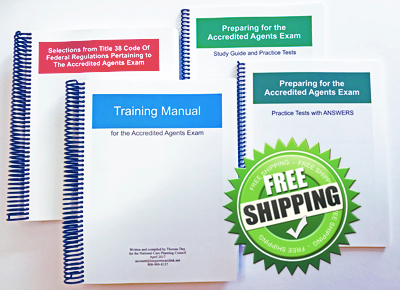 "I sat the VA accredited agents' exam today. Just wanted to say thank you to your organization for the materials you provide. It helped steer me in the right direction and prepare me for the exam. Without your materials I would have found it much harder to focus as the regulations are so voluminous. In particular, I spent many hours reviewing your sample tests so that I was familiar with the type of questions when it came to the exam. The [actual] 28 questions seemed easy after doing your sample tests!"